Big band jazz music, with its powerful blasts of horns, drums and cymbal splashes, and layers of warm woodwinds, provided a bedrock for American music culture in the mid-1900s. Many of the popular genres that sprang to life from the 1940s to the present were built on the foundation of big band and used it as a reference for innovation. What Is Big Band Jazz? Big band jazz is music written and arranged for an ensemble of brass, woodwinds, and percussion, usually with a bandleader, often playing arrangements of popular songs from the 1910 to 1940s era. It is known for its loud volume and ability to play large venues and accompany large crowds at dance halls in an era when sophisticated live concert sound technology did not exist, thus the term "big band." 1700s and early 1800s: America, a nation of immigrants mostly from Europe, imports a variety of European music traditions ranging from folk hymns, fiddle and guitar-based jigs, and rural ballad traditions to classical music and its waltzes and systematic music theory. One factor common to all European music is its emphasis of single melodic lines accompanied by harmony (i.e. chord progressions). 1832: The German-born Christian Martin, the founder of Martin guitars, moves to New York City after immigrating to Pennsylvania from Vienna, Italy. He opens a music shop shortly after arriving in America and eventually innovates guitar design to create his famous steel-string acoustic guitar. The popularity of Martin's small, rugged, affordable acoustic guitar makes musical innovation and performance easier and paves the way for new music genres in the South. 1865: After the Civil War, African-American residents of both rural and urban black South ("urban" referring to cities such as Memphis and its Delta Blues sound) blend West African rhythmic roots and pentatonic scales with the melodic-based melting pot of European music to create the blues sound. 1867: John Philip Sousa, the son of a Portuguese father and German mother who immigrated to America, begins playing the trombone and composing. His songs and arrangements turn the marching band into a cultural phenomenon that brings loud, exciting brass, woodwind, and percussion-based music to the masses. 1898: The end of the Spanish-American war landed many military bands in the port of New Orleans where they were decommissioned. This left piles of used brass instruments in New Orleans, and residents there, especially in the black communities, acquired these instruments and taught themselves to play. This accelerated the creation of unconventional sounds and stylistic innovations, which was already happening with ragtime, and it birthed the ensembles of Dixieland jazz, a precursor to big band jazz. 1910s - 1920s: The prevalence of big brass marching bands begins to mingle with the growing popularity of jazz. As America moves from WWI into the glamor and indulgences of the Roaring Twenties, it becomes increasingly popular for loud brass-centric jazz bands to play dance halls across the country. Bands rely mostly on improvisation and loose structure. 1930s: The first big band jazz bands form and become increasingly popular across all cultures and levels of society. Bandleaders begin organizing their bands with written music, arrangements, and structure for solos, which becomes a hallmark of the big band jazz style. Saxophones replace clarinets because of the saxophone's louder volume, and this becomes another hallmark of the big band sound. 1940s: The bombastic but elegant big band jazz sound, which takes America by storm during the WWII years, proves itself to be a masterful blend of structured European music traditions, the loud brass and horns of marching band music, and the new African-American music genres of blues, ragtime, and jazz that have emerged from the South. The skillful blending of so many distinctly American musical traditions is what makes big band jazz so special. This is why it is impossible to understand what big band jazz is without knowing its history. It is a portrait of America and all its layers of musical diversity that existed during the late 1800s and early 1900s. The following artists provide vivid examples of the life of big band jazz, how it varied and how it evolved. James Fletcher Henderson, a father of big band jazz and mentor to many of its stars, had the most commercial success in the 1920s with his jazz band. He helped form the signature jazz sound that would eventually birth the swing jazz in the following years, which would evolve into big band jazz. He kick-started the careers of saxophonist Coleman Hawkins and trumpet player Louis Armstrong, both musicians who played in his band, and other prominent musicians and future bandleaders such as John Kirby and Red Allen. Another father of big band jazz alongside Fletcher Henderson, Ben Pollack's band was one of the most successful during the 1920s, and his musicians included future stars Benny Goodman and Glen Miller, who both take the music world by storm during the 1930s and WWII years with their trademark big band sound. Don Redman is known as the first famous band leader who did written arrangements and organized parts with careful structure and planning. He had his first band in the 1930s and goes on to have his own TV show on CBS in the late 1940s. He is also known for innovating the "swing choir," in which musicians sing versions of the songs lyrics to a different melody than the main melody. Coleman Hawkins, who started with trailblazing bands such as Fletcher Henderson, is considered the first tenor sax jazz player and one of the greatest of all time-the father of the jazz tenor sax. His tremendous success and influence likely started, or at the very least heavily shaped, the trend of using saxophones more prominently in the band. Known as the King of Swing, Benny Goodman's landmark dance hall gig at the Palomar Ballroom in Los Angeles in 1935 is often considered the breakthrough point into popular culture for swing jazz and big band music. Goodman's legendary song Sing, Sing, Sing, is one of the great iconic songs of American music history in any genre and is instantly recognizable by most people, even if they don't know the name of the song. Goodman was also one of the first white band leaders to mix ethnicities in his band without apology or hesitation. He is quoted saying: "If a guy's got it, let him give it. I'm selling music, not prejudice." Ellington also kick-started the career of legendary trumpeter and alto saxophonist Benny Carter and seemingly countless other musicians. During his lifetime, he was the recipient of the Grammy Lifetime Achievement Award, the Presidential Medal of Freedom, and the Legion of Honor by France. Another iconic big band leader who was portrayed by actor Jimmy Stewart in a Hollywood biopic, The Glenn Miller Story, Glenn Miller and his orchestra were especially famous during the WWII years when most of his biggest hits were released. As depicted in the film, he began in 1935 but struggled to find a successful sound until he discovered a unique way to orchestrate the saxophone parts by placing them in higher registers similar to clarinets. This high, tightly clustered sax harmony became a trademark sound in songs such as his iconic Moonlight Serenade. On December 15, 1944, Glenn Miller boarded a plane to Paris to prepare the way for his band's six-week tour of Europe where he would play for the trips. However, his plane never arrived, and what happened to him has remained a mystery. Miller received the Grammy Lifetime Achievement Award posthumously. 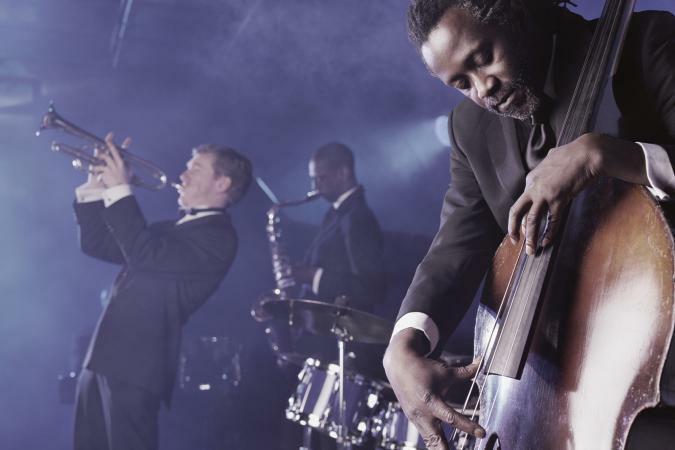 Modern music fans today may not listen to big band jazz music as often as other genres, but every popular style today has walked the road that big band jazz blazed. It created a performance concept that artists take for granted today: the idea of ensembles playing written arrangements of popular music at loud volumes to large crowds, a trend that would evolve into what every popular music genre tries to do today.